Can't decide between orange marmalade and berry jam? Make our 30 Minutes to Homemade SURE.JELL Strawberry-Citrus Freezer Jam! Stem and crush strawberries thoroughly, one layer at a time. Measure exactly 1-1/2 cups of the crushed strawberries into large bowl. Grate oranges; add grated peel to strawberries in bowl. Peel, section and finely chop oranges; add to ingredients in bowl. Grate limes; add grated peel to ingredients in bowl. Squeeze juice from limes; add juice to ingredients in bowl. Stir in sugar. Let stand 10 min., stirring occasionally. To get exact level cup measures of sugar, spoon sugar into dry metal or plastic measuring cup, then level by scraping excess sugar from top of cup with a straight-edged knife. Freeze just-picked berries for later use. Wash and freeze berries in single layer on baking sheet. When frozen, transfer to freezer bags. Freeze up to 3 months. Do not double recipe. If making larger quantities of jam, prepare in separate batches. Jam or Jelly Didn't Set? Every once in a while, you may find that your jam does not set the way you expected. 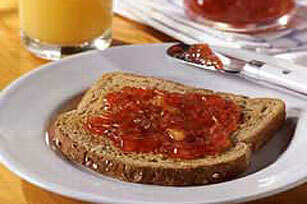 If your efforts resulted in a runny batch, try our Remake Directions to improve your finished jam. If your jam still doesn't set, you can always use it as a glaze or syrup.